Welcome to Miami Beach Adult & Community Education Center. We are committed to continue to develop and enhance our outstanding adult education programs in this thriving Miami Beach community. Your dedication to our students, your commitment to their learning, and your degree of preparation in your area of expertise will serve as the impetus to propel them into a bright and successful future. Our programs include English for Speakers of Other Languages (E.S.O.L. ), dual enrollment, high school completion, state-of-the-art technological programs, industrial technology programs, family/consumer science, and community enrichment programs that respond to the needs of this distinct community. Our school has developed a reputation for helping others in need across the country and in our immediate community. As we begin another year, let us focus on how our lives can be of service to others. Our participation in the Ronald McDonald Pop Tabs Campaign, our leadership in the United Way campaigns, our Holiday Canned Food Drive, and other ventures aimed at assisting others has earned us the title of The Little School with the Big Heart – and we continue to grown. The focus of our Education Center is our students. By serving our students to the best of our abilities, our school thrives as we honor our Miami Beach Community. We treat our students with the highest level of professionalism. We honor their differences through respect and celebration, for our mission is to develop life-long learners with a passion for education. As we begin the 2007-2008 school year, our focus is to encourage our students to reach for the stars, to seek happiness, and to leave our Education Center having experienced life’s possibilities. Our mission is to guide our students to pursue their dreams with commitment, vision, passion, and a spirit of excellence. Let us exemplify this excellence through our preparing well for class, creating a safe stimulating environment, and modeling our professionalism as masters of our trade. This we do as educators who are grateful to our students and our community. 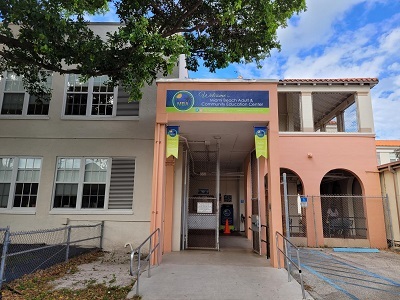 I want to thank you, our faculty and staff, for being an integral part of our Miami Beach Adult and Community Education Center and for always trusting in the belief that we are here to provide to those who need it the most.